Which it strangely interprets to mean that it ONLY needs to minister to and attempt to convert ‘the kings,’ which in the United States evidently means governors, senators, presidents, and congressmen. So, they do their best to convert and ‘help’ those in power, with the idea that someone is in power not because of any of his or her own deeds but solely because God put him or her there. This, of course, means that the ends justify the means in any situation and power should be gained and maintained at all costs, since clearly God ordained this power structure. It probably gives you a good enough idea of their mindset to tell you that they idolize Hitler and Lenin for the power that those men had, although they of course say they want to use this power for Jesus. In addition to a description of the The Family itself, Sharlet also discusses their religious-political progeny in Uganda who are trying to enact legislation to criminalize homosexuality to the point where ‘aggravated’ homosexuality (repeat offense) will be punishable by death and ‘promotion’ of homosexuality will be punishable by imprisonment. The section on fundamentalism in the military – it is particularly well entrenched in the Airforce – was also particularly frightening for the degree to which it is part of the establishment and people of other religions are harassed. I listened to this about a week before Halloween and boy, I cannot imagine anything scarier. You want to give me nightmares? Skip the zombies and vampires, give me men in the highest ranks of power in this country, and influencing those in the highest ranks of power in this country who emulate the power of Hitler and Lenin. That being said, I thought that Sharlet communicated this threat in a very clear manner, both in terms of organization and language. The one thing I thought odd was his re-imagining – twice – of speeches which Mark Sanford might have given, had his lies and infidelities not been discovered. In the midst of such a factual and well-researched book, these suppositions seemed out of place and perhaps even inappropriate. Other than that, though, it was all very well done, as well as compelling (and absolutely terrifying). I should note, that even as a Christian myself I was absolutely horrified by the confluence of political power and religion here. I wasn’t entirely sure about Jeremy Guskin at the beginning of “C Street,” but I grew accustomed to his style after about 5 minutes and actually really appreciated his narration. He did include vocal variations for emotion and expression, but primarily kept his voice steady, without becoming monotone. I thought it served Sharlet’s journalistic background and style very well. I definitely recommend this book if you are interested in the intersection of power and religion in America. 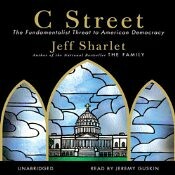 Whether the audio or print is preferable probably depends on how in-depth you wish to go into Sharlet’s account. I was happy just letting everything wash over me – I was horrified enough as it was – but other have said they would have preferred this in print so they could take time with the details. Your call.